FTC : I bought this book. One line summation : Someone tries to kill a powerful Psy woman so she moves in with a clan of Russian bears because the Alpha wants to protect her until the threat is neutralised. I’d like to start by saying that I don’t think you can start the series at this book. I know it says book one but the implied knowledge is immense and some of the character development for the major players in this arc is done way before this book. This instalment was very different to what I’ve come to expect from the Psy-Changeling series but I enjoyed it all the same. I will be reading the next one. Silver is the scion of the Merchant clan; powerful, rich and silent. When someone tries to kill her in her own home, there really is no one she can trust. For some reason she wants to trust Valentin though and so she moves into Den home. Being amongst a clan of bears is miles away from the ordered existence she’s used to but she can’t help but fall into an easy routine. Being around Valentin should be more difficult than it appears to be but, for some reason, she finds it all too comfortable. But the course of true love never did run smooth and, with an assassin loose and an emotional epiphany to sort through, there was bound to be something go blooming wrong. Valentin was a fantastic Alpha of the Bears. He had a heart of gold and I wanted the man who gave so much to get his HEA. He came across as a charming softy but it was clear that he could hold his own and his pack together. I did worry that he gave too much, that he lacked the ruthless edge that I am used to in my Alpha’s, but he eventually did do what he needed to protect that which he considers his responsibility. Even when it threatened to break him. Silver is more an Alpha than I’m used to in my heroines for this series. 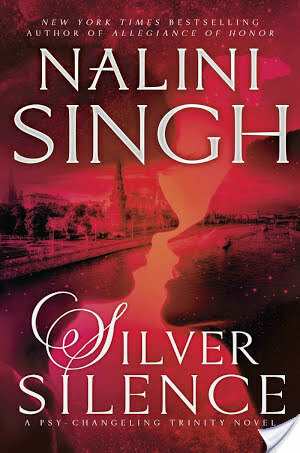 They are all strong women (Singh writes fabulously strong heroines) but Silver was a different level. She’s been in a position of power throughout the last arc and you can sense just how powerful she is throughout this book. The only thing that she seems to be lacking is the emotional warmth that she never needed in her Psy clan but she is in the perfect place to learn about emotional warmth in a clan of bears (so cuddly!). Let me start with the fact that I liked the characters. I liked the strength of Silver and I enjoyed the charm of Valentin throughout the whole tale; the issue was that their chemistry didn’t click for me until around half way through the book. By the end, I was rooting for them, and my heart just broke for their situation (true love never does run smooth in a Nalini Singh book! ), but it just took me a while to get there which is a bit of an anomaly for me with a Psy-changeling book! I think the issue I had with this book was that it felt a bit too much going on in one book. We were introduced to a whole new set of Shifters, with a very different set of social rules, a very complicated arc, which also involved the Human Alliance, and we also had the romance. My attention was completely split and I just couldn’t get excited about a HEA whilst I was getting my head around it all. In fact, I was possibly more excited about Bo and baby bears than I was about Silver and Valentin at the start of the book and I’m pretty sure that’s not how this was supposed to go. It was all good by the end and I truly want to read more about the bears … they are so much fun. Overall, an exciting start to the series but I just wish there had been less in the book. It will be a reread as I know I’ve missed things that will end up being important.